"I have a date with the President, I will tell him something in the SGR official launching in Mombasa." Says Hassan Joho. - Bana Kenya News, Real African Network Tubanane. Home featured Mombasa "I have a date with the President, I will tell him something in the SGR official launching in Mombasa." Says Hassan Joho. "I have a date with the President, I will tell him something in the SGR official launching in Mombasa." Says Hassan Joho. 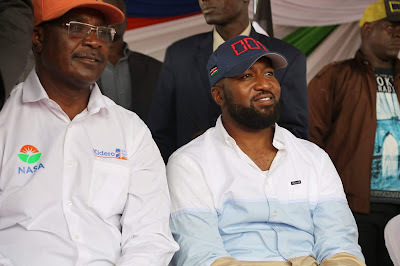 The Mombasa Governor Ali Hassan Joho called President Uhuru Kenyatta and his deputy William Ruto " thieves " in a broad day light and said he will ascend in the podium where the government will be launching the standard gauge railway in Mombasa. Governor Hassan Joho claimed that Mombasa has been taken for granted because most jubilee projects do not benefit directly the people of Mombasa but his own people. He said that all major areas and national government projects are not run by the locals but deported people. "I have a date with the president that day they will be opening the SGR I will go because it is in my county and I will ascend to the podium and ask the president some questions. Am prepared for that day," he said. The Mombasa governor attended the Jacaranda grounds rally where the ODM leader was officially announced as the NASA flagbearer as they handed over their Presidential papers before at KICC. Today, the Governor was given a clearance certificate by IEBC to vie for the Mombasa gubernatorial seat. He presented his papers at the IEBC offices near Statehouse, Mombasa. The incumbent governor will be competing with his senator Omar Hassan (Wiper) Hezron Awiti (Independent) and Mombasa tycoon Suleiman Shahbaal (Jubilee).